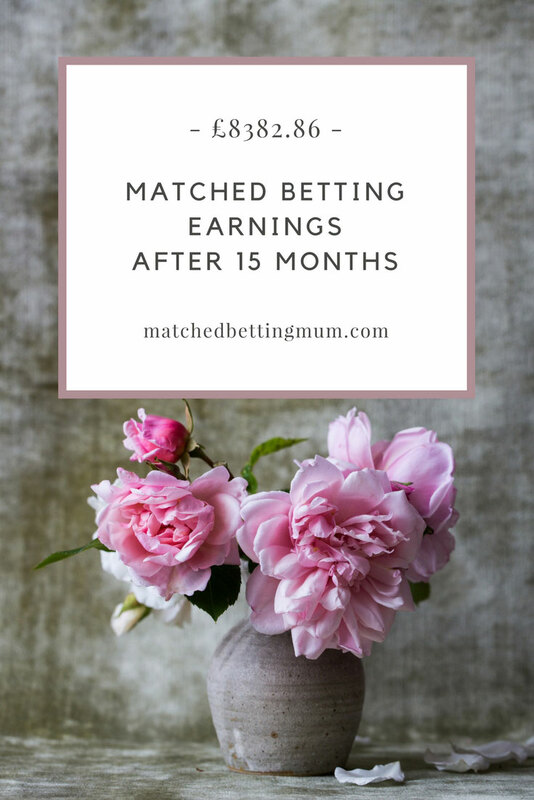 My monthly matched betting diaries detail the amount of money I make matched betting each month. What with running this blog, managing some other work I’ve taken on and looking after two young children, I don’t have a lot of spare time for matched betting. However, I still manage to make around £500 per month. By sharing these diary entries I aim to show how this is possible. If you’re wondering how you can find the time for matched betting, then check out my matched betting daily planner. This sets out the different activities I complete every day to help me stay on top of my matched betting. The total amount I made matched betting in September 2017 was £450.25. After a quiet summer and time out of the country last month, I was looking forward to making some decent money once again this month. There were lots of offers available to take part in. However, I didn’t factor in that I had plans every weekend this month. This is when most of the offers are available. So, as the month progressed, I was doubtful whether I’d make anywhere near my £500 target. However, by attempting some reload offers I’d previously dismissed I found that my earnings kept creeping up. I’d previously ignored them because I thought they might involve too much effort for very little reward. However, in reality, they actually didn’t involve too much extra effort at all. The lesson from this is to always attempt as many different offers as possible. In fact, if I hadn’t had some bad luck on my accumulator bets, I’d have met my target easily. However, I’m more than happy to have only fallen short of the £500 target by only £50. Particularly as my matched betting was limited to a maximum of 4-5 hours each week. I’ve made nearly £8500 since I started matched betting last year. I’ve made a total of £8382.86 since I started matched betting in July 2016. As I’ve been doing matched betting for more than a year now, most of the offers I complete are reload offers. These are the ongoing offers bookmakers have available. These enable you to make money matched betting month after month. Most days I check the list of offers on Profit Accumulator and also review the ‘How to Make £1000 a Month’ thread on Profit Accumulator’s forum. This ensures I know about new offers as soon as they become available. This month I was pleasantly surprised that there were lots of offers available with new bookmakers. Completing these offers gave my earnings a real boost. With the football season back in full swing, there were lots of different offers to get involved in this month. This month, I attempted lots of lower risk offers. While none gave me any substantial wins, the small amounts of money I kept banking slowly added up. It is important to remember that not all casino offers are risk-free. Profit Accumulator always analyse each offer and provide guidance about the amount of money you are likely to make and how to approach the offers. I tend to tackle the riskier offers when I’m confident of making my £500 monthly matched betting target. And I’ll only ever tend to risk a maximum of £25 at any one time. It’s important not to rely on casino offers alone for making money. However, I use them to top up my earnings and am prepared to get involved in the riskier offers if I’m having a good month. As my previous diary entries show, I have on occasions ended up down as a result of participating in these offers. As there is no guarantee of a free bet, these are riskier offers. You will suffer some qualifying losses if the refund trigger does not occur. My guide to the different types of risks involved in matched betting might help you understand more. I always check the Sportsbook Signup Offers listed on Profit Accumulator every couple of months. There are always new bookmakers emerging onto the market. And most will have lucrative signup offers. I was very surprised to see three new bookmaker offers which made me quite a substantial amount of money this month. Completing these offers reminded me just how frustrating it can be completing some of the new offers. Many have large rollover requirements attached to them. This can be time consuming and laborious! If you’re at that stage, I’d urge you to keep going. Once you complete the signup offers, you will find you understand the matched betting process much more fully. And you’ll be able to complete the offers much quicker. And what’s more, the reload offers rarely involve too much effort. This means the longer you do matched betting, the quicker and easier it is to make money. Price boosts are when bookmakers increase the odds on certain events. These odds will often be higher than the prices on betting exchanges, which means you can make money instantly simply by placing a qualifying and a lay bet. I love completing price boosts because they are very quick and easy to do. The amounts of money you can make from price boosts may seem very small – only a few pounds at a time, if that. However, it takes only a couple of minutes to complete the bets. And this money very quickly adds up. To stay on top of them I follow the ‘Price Boosts Thread’ on the Profit Accumulator forum. Since some price boosts may only be available for a very short time, this ensures I receive an alert as soon as a boost is posted to the forum. Most months I tend to make between £50-£100 from price boosts alone. There seemed to be fewer profitable price boosts available this month. But this may be due to the fact that I didn’t do any matched betting at the weekends. I recently wrote a guide about making money from accumulator bets. With the return of the football season, I was hoping to do more accumulator bets. However, I didn’t anticipate that most bookmakers would either withdraw their offers or significantly alter their terms and conditions. While there are still lots of offers available, it will be much harder to make significant amounts of money from them. This is particularly the case for me, as I don’t have a great deal of extra time to track and stay on top of my accumulator bets, especially if my weekends are busy. That said, there is still money to be made. So I decided to undertake a few different offers this month. My usual approach is to use the normal method and hope for a refund if only one leg loses. I will usually underlay each leg to reduce my qualifying losses. And if that team loses I will then swap to the refund lock in method to guarantee a small profit. This didn’t work out on any of the accumulators I attempted this month. Firstly, I had a run of bad luck in that the lay odds drifted for nearly all of my selections. This meant my qualifying losses racked up quite significantly. So when I had a loser towards the end of each accumulator I decided to take a chance for the refund (as it would have been impossible to make a profit from the lock in method by that stage). Unfortunately, luck wasn’t on my side as all of those last legs also lost. This has burnt me a little. It certainly is possible to make money from accumulator bets. But you will also make some losses. So I think it is probably best to do these types of bets only if you can place lots of them at the same time. It will then be easier to mitigate against your qualifying losses. As I simply don’t have the time to do this, I think I might take a little break from accumulators for now. I’ve previously written about how easy it is to make mistakes when you do matched betting. This month’s error was unfortunately caused by my rogue desktop computer. It’s got a very sensitive touch screen and mouse pad which inadvertently selected a completely different bet than I was planning to choose. In my rush to get the bet placed, I didn’t double check what I was doing. So I backed the wrong selection. It was quite a large bet, which I had to cash out, costing me £5. So now I’m being extra cautious when I’m using the computer to place bets! A very honest appraisal, and I can see your hesitation on accumulator bets now after being ‘burned’. Still think you’re doing incredibly well! Matched betting really does work! I made £17,500 tax-free since March 2017. To make more money from matched betting, having a big enough bankroll really does help! That’s an excellent result Adam, well done. It certainly helps saving up the money you make – which then gives greater flexibility when placing reload offers.